As home to many of the UK’s highest rated beaches, more ancient woodland than you can shake a 6,000-year-old stick at, and historical adventures galore for all the family, this region has all the ingredients you need for an unforgettable family holiday. 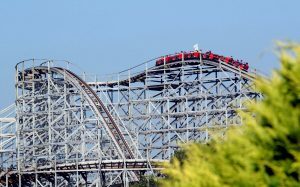 Oh, and did we mention it’s also the location of Oakwood Theme Park, where you’ll find Britain’s favourite wooden rollercoaster? Place your finger anywhere on a map of the Pembrokeshire coast, and you’re guaranteed to be pointing at a beautiful, idyllic beach. Barafundle Bay, for example, regularly tops lists of the best beaches in the UK, with its award-winning clean waters and soft sand, but our tip is to check out some of the others too. In fact, take your pick. Because with 243 beaches to choose from in South Wales, there’s a hidden gem and sandy paradise around every bend of the coast. If the idea of overcrowded tourist traps makes you want to run for the hills, then great, because we’ve got the perfect hills for you. And with mountain bike rental available for ages four and up, you won’t even have to do the running. In fact, a ride around the Llys-y-Frân reservoir circuit is the ideal way to get up close with the rolling countryside of South Wales. And the countryside really will roll when you hit the rollercoaster, as the steepest part of the 6.5km circuit is known. Get hands on with history on a journey through the mists of time at the local reconstructed iron age hill fort, Castell Henllys. The kids can enjoy a supervised afternoon of storytelling, shadow puppets, and flour grinding, and even bone up on their mud flinging and hunting techniques. And whilst they perfect their spear throwing, you can take an amble through the ancient woodlands, explore the roundhouses, and generally enjoy the peace and quiet of 300BC. Oakwood Theme Park may be known as the home of tot friendly Neverland, but that isn’t the only piece of classic children’s literature brought to life you’ll experience in South Wales. Because if you visit Stackpole Nature Reserve, you can have a go at being Doctor Doolittle, and see how many of their famously tame wild birds will eat out of your hand. And whilst we’re talking about nature, have you really been to South Wales if you don’t hop on a boat and pay a visit to the puffins and porpoises of Skomer Island? You may even spot a grey seal if you’re lucky. With over 40 rides that offer thrills for young and less-young alike, no trip to South Wales is complete without a pilgrimage to the country’s best adventure park. 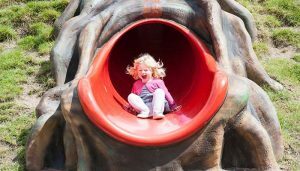 So swap wildlife for wild rides and rolling woodlands for wooden rollercoasters as you experience old favourites like ‘Bounce,’ which has been jazzed up for the new season, and enjoy our brand new family-friendly head spinner, Dizzy Disk. And whilst your staycation may not last forever, our new Oakwood Theme Park Season Pass will. Costing only slightly more than a Day Ticket, it’s the perfect excuse to come back time and time again, with unlimited entry throughout the year. Book yours online now and save.